James Holden re-introduced the 0-4-4T type in 1898 with his Class S44 (LNER Class G4), for working the Enfield and Chingford lines. He had already designed the F3 2-4-2T for similar work, so it is unclear why he switched from the 2-4-2T wheel arrangement back to the 0-4-4T arrangement. 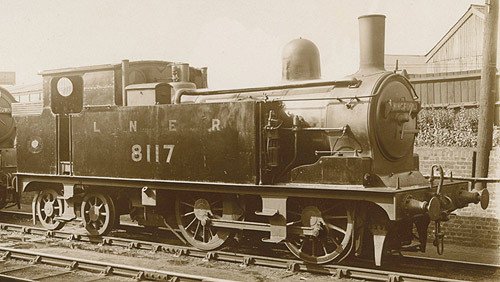 The reason might be related to his use of the larger boiler which he designed as a replacement for use in his predecessors' 0-4-4T locomotives, in the G4. A total of forty G4s were built at Stratford in four batches between 1898 and 1901. The last batch of locomotives were built with slightly lower water tanks, but with an extra water tank in the bunker space. This increased the water capacity from the original 1100 gallons to 1349 gallons, and reduced the coal capacity by about half a ton. The thirty existing G4s were similarly altered. After Grouping, the G4s were fitted with steam heating connections. Most were converted at the end of 1924, although ten would not receive steam heating connections until 1926. The G4s could record fast speeds when hauling non-stop services, but acquired a reputation for slow starting when hauling heavy suburban trains. By the 1920s they were based out of Liverpool Street, as well as running services on the Enfield and Chingford lines. Increasing train weights were taking their toll though the 1920s and 1930s, and they were moved to lighter rural duties. The first two G4s were withdrawn in 1929. Withdrawals would continue through the 1930s with the last G4 being withdrawn in 1938. Heating Surface: Total: 1084 sq.ft. None of the G4s survived into preservation. I am not aware of any models of the G4 tank locomotives. Thank you to John Piper for the above photograph of G4 No. 8117.